A large female walked up behind us on the trail today. She sat down, then sat up with her paws resting on her knees, looking up at the leaves in the treetops scattering with each tug of the wind. I WOKE TO A CLEAR, BLUE-SKY DAY, UP AT 7:30. There was good morning light on a sow and triplets out on a grassy rise. A bear came up behind us while we were filming the sow and cubs, maybe 20 yards away. Matt cautioned, "Deborah, don't move." I have learned not to question. My eye didn't leave the eyepiece. We stood still. I asked what was going on. Matt said a bear had joined us, just off to my right. The hardest part about playing fly-on-the-wall in the brown bear's living room is getting enough sleep. "I mean, your ears are wide open all night long, sometimes to the point where you're listening so hard, you'll hear something and you'll wonder, 'Is that my stomach growling or is that a bear three feet away from my ear?' "
Even so, the nightmares Alaska filmmaker Deborah Schildt had while sleeping among inhabitants of Katmai National Park & Preserve had to do with a different kind of wilderness -- that of Los Angeles, where she worked in the film industry for eight years. The time she woke up shouting "Help!" she felt silly. Then she felt relief that she was among wild carnivores the size of refrigerators rather than muggers and L.A. drivers crazed with road rage. She doesn't miss L.A. Life was frenzied back then, when she worked hideously long hours in a ruthless industry on big-budget commercials and feature films big and small, from Steven Spielberg's multimillion-dollar "The Goonies" to "Belizaire the Cajun," which she describes as "little bitty Sundance picture" with Robert Duvall in the cast. She may no longer work with actors like Dan Aykroyd, Linda Hunt and Dennis Hopper, but now she has Bullet, Snaggletooth and Spike. If anything could be an antithesis of her previous life, this is it: sitting still for hours, camera ready, waiting for whatever might happen to happen, and a little too often doing that waiting in the rain. Yes, we saw bears -- early this morning, after my camera stopped working due to excess condensation. The same three as last night. A younger boar stole away a sow from an older boar while he was busy rubbing on trees to establish his dominance. It was hard to shoot even stills today with so much rain. It takes an almost Zen-like frame of mind to gather the kind of footage Schildt and collaborator Matthias Breiter have in mind for this project -- still a work in progress -- that will tell the story of Katmai bears. The Germanborn Breiter, a biologist and wildlife photographer living in Canada, has been working with and photographing these bears for more than 15 years, often for months at a time. He's the author of several books, including "The Bears of Katmai," and has published photographs in magazines around the world, including National Geographic and Outdoor Photographer. The two first teamed up, along with mutual friend and filmmaker Mark Dionne, for a trip to Round Island in Bristol Bay to film and photograph walrus. "We were up there for five or six days. When we weren't filming, we spent a lot of time talking and getting to know one another," Schildt said at her home in Palmer, where she lives with her husband, Murray Bartholomew, and a golden retriever named Rosie. "And I think that's probably where the seed of doing a bigger piece on bears was born. From that point on, it was trying to figure out how logistically to do that, how to film the bears in a nonobtrusive way. "What Matt brought to the project is that he's an extremely gifted wildlife photographer with years of experience working in remote Alaska and working with bears. I had years of experience working in film." Pooling their resources will let them show bears doing what bears do through the seasons, from mating in the spring through the first snows of winter. To achieve the depth they were after, they needed to spend enough time with these bears to be ignored. "(Breiter's) way of shooting bears has always been to be a quiet observer," Schildt said. "It wasn't the kind of project where you could go out there, spend five days shooting and have it in the can," she said. "It was going to take a long time of sitting and waiting. And that's the style Matt is used to, sitting and waiting for the moment. He's familiar with some of those bears. ... He knew them when they were cubs, and now they're adults raising offspring. And because of that relationship, he gets a different kind of shot. He captures a mood. I feel there's more of an intimacy in his work." Bears have their "magic circle," their comfort zone, a place no human should encroach upon, they both say. It's an odd term, Breiter thinks, but widely accepted now. We did get great surf shots. Especially one sow and cub fishing with the surf crashing down on them then -- A bear is here RIGHT NOW! I can hear him standing just outside, breathing heavy. Breiter hopes this documentary will leave viewers feeling that way but also with a better understand of these bears and their valuable place in the world. "People either see them as horrible monsters or as teddies, and bears are neither," he said from his home in Kenora, Ontario. People think of these coastal bears as an exception, he said, that because they have an abundance of food, they're more accepting of humans, that this behavior is not normal. Breiter thinks the opposite, that this is a bear's true nature, and it wasn't until humans encroached upon their territory and food sources became thin that bears got the reputation of being more dangerous, more desperate. Schildt and Breiter have worked together on other projects, including "People of the Caribou," a documentary on the fight by 5,000 Gwich'in to keep oil drilling out of the Arctic National Wildlife Refuge. Their collaborative work has gone to the British Broadcasting Corp., the National Wildlife Federation, the Discovery Channel and others. This bear project has captured Schildt's fascination in a way that surprised her. 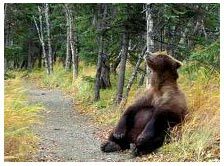 The thrill, the tension, the overwhelming sense of privilege being among bears. She feels so much more alive out there than she ever did on a set in L.A.
Matt started telling me Bullet stories midstream as we crossed. Bullet happened to be facing us, fishing maybe 30 yards off. "In his youth he terrorized fishermen up and down the river," he said. My step quickened as much as it could carrying 30 pounds of camera gear and up to my thighs in a strong current. When we reached the comfort of the shore, he added, "Of course, he's mellowed in his old age now, but I thought that might get you moving a bit faster when we crossed." One does feel alive out here, always on point. Schildt and Breiter were last in Katmai at the end of October. They'd hoped to get those first-snowfall shots then. It didn't work out, but for a good reason. "We ended up coming out three days early because Matt's wife, who's expecting their first child, her water broke three and a half weeks early," Schildt said. "So a ranger came to our camp one morning and said, 'Matt, your wife just called the ranger station in King Salmon. ... She's on her way to the hospital.' "
They threw all their gear together and called for a plane, which was grounded due to thick fog. After several hours of waiting, the plane finally made it. From King Salmon, Breiter flew standby to Anchorage, and from Anchorage standby to Minneapolis, and from Minneapolis standby to Winnipeg, Manitoba, where a relative met him with a car for the long drive to the hospital. He made it in time to see his daughter born. He and Schildt will return next spring. And again and again, if need be. As Breiter put it, "It's done when we have what we want." All the while Schildt has been filming, she has also been taking stills here and there. 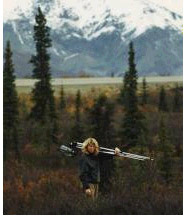 Her favorite was shot from the hip with a digital camera while she was filming a family of bears fishing. "And there was a particular sow and cub that were out there fishing. She would catch one and give it to the cub, and the cub would take the fish to shore and then would go back out and be by mom, the waves crashing over their backs. We set up both cameras and taped for quite some time. "Another photographer out there said, 'Don't move, there's a bear behind you.' And we look over our shoulders, and there's this female that had just come down the trail and stopped. "She plops down and just looks up in trees at the leaves blowing. She's just sitting there watching the wind blow through those leaves, just completely oblivious to us, enjoying the day. "I call her the Buddha Bear. She let us share that moment. She let us into her magic circle." These are the kinds of moments she turns to Breiter to say, "Thank you. I really love doing this. I love being in this space."